Now that temperatures have officially hit 100°F, I’m more than ready to start introducing BBQ sandwiches into my diet again. We had the most lovely weekend in the sun; my mom was in town and we took Vander to the outdoor pool for the first time. I was a bit nervous on how he would do since bathtime is still hit or miss, but he loved it! I bought him a little floaty and he cruised all around the pool in it when he wasn’t giggling at BL and I going under water and popping back up. Summer, I’m so, so excited that you’re here. I’ve discussed my dilemma with most veggie burgers multiple times; most of the time they don’t live up to the hype and they rarely impress my omnivore friends. 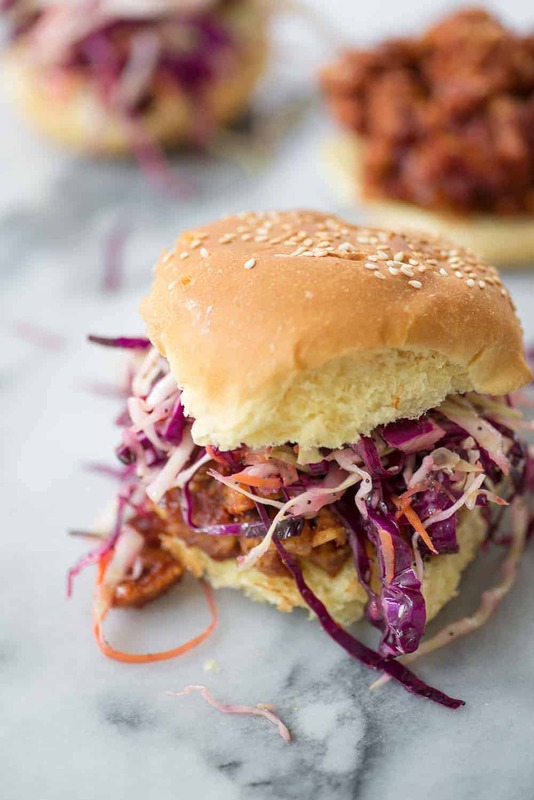 Thankfully, these BBQ sandwiches are not only perfect for a cookout, they are meaty and hearty as well. I’m making things a bit more complicated by making my own homemade BBQ sauce, but feel free to skip that step if needed. I like making my own sauces because most of the store-bought ones can taste off, but I also realize that takes more time. Chop your tempeh into whatever size strip you like; I prefer the tempeh in hearty chunks but you could also grate the tempeh to create a sloppy-joe like texture. Pour the BBQ sauce over the tempeh and bake until soft and slightly burnt on the outsides. Those burnt pieces create the perfect texture when pilled on top of a sandwich. How do we feel about tempeh? I find that it’s one of the plant-based proteins that people are most unsure about but then love when they actually try it. I make a sandwich like this often for omnivore friends and they are always blown away by how meaty it actually tastes. Well, duh. Do you think that we predominantly plant-based eaters don’t love good food? Just because I don’t eat animals doesn’t mean I don’t eat well. These sandwiches are proof of that. 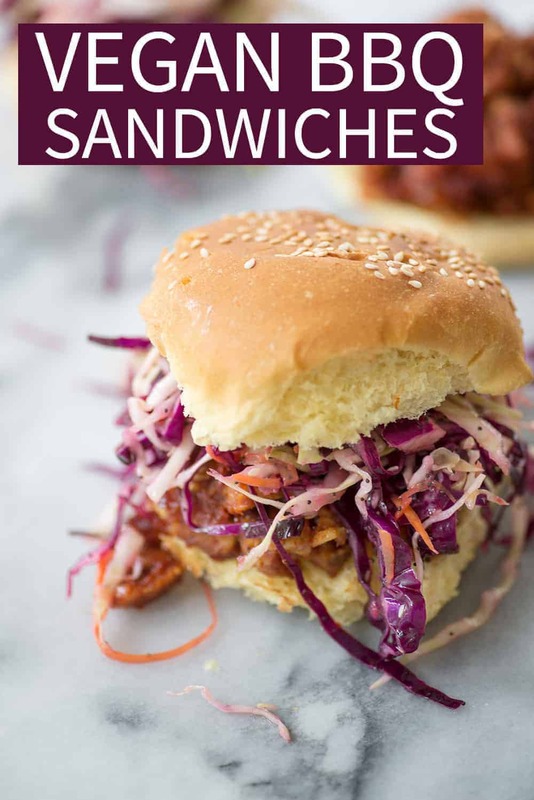 I can’t imagine a BBQ sandwich without coleslaw on top, so I made a quick version using shredded green and red cabbage and carrots. I recently bought this mandolin and it’s been essential in creating coleslaw in mere minutes. I’ve had a few mandolin’s over the years and while this one takes a little bit to figure out how to best use it, it’s the sharpest one I’ve ever used. Paper thin vegetables, coming right up. Put the whole thing together, and you’ve got the perfect dinner. Lastly, I can’t stop thinking about the reports of children being separated from their parents after arriving to the states. Whatever your politics, I think we can all agree that removing scared, helpless infants and children from their parents is a cruel, heartless punishment. I’ve always been fairly empathic and this has only heightened after becoming a mom. Every news story I read, I instantly picture my sweet, innocent Vander and the tears just start flowing. My heart aches for both the parents and the kids. If you’re also moved, then you can donate to organizations who are fighting to help these children (I just gave a donation to Together Rising which is organizing a Love Flash Mob for this effort) and let your elected officials know how you feel. I’m a big believer in letting my voice count and I contact my representatives often. While I’m sure my individual voice doesn’t have much of an effect, I do believe that the collective voice matters. 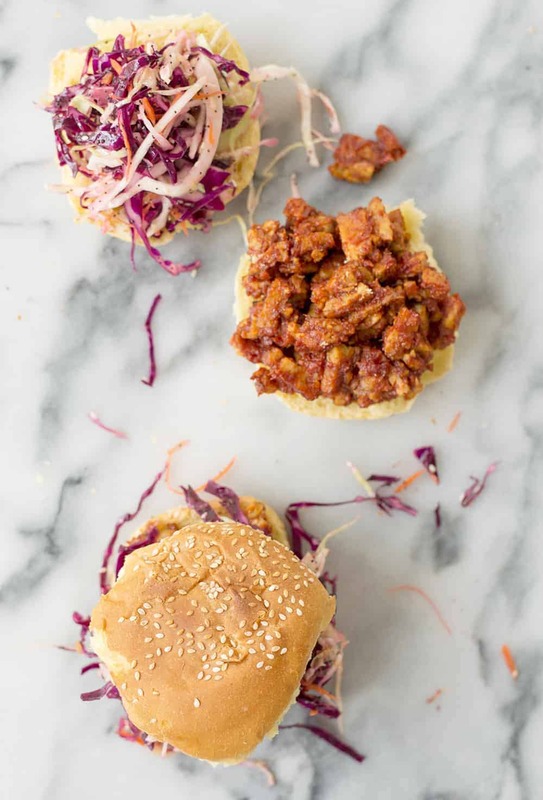 BBQ Tempeh Sandwiches, perfect for vegan barbecues! Crispy vegan BBQ with vegan rainbow coleslaw and homemade dressing. Preheat the oven to 425 degrees F. I chop the tempeh into small cubes, but you can also slice them into slabs for a piled BBQ sandwich or grate the tempeh for a ground tempeh BBQ sandwich. Lightly spray a glass baking pan with cooking spray. 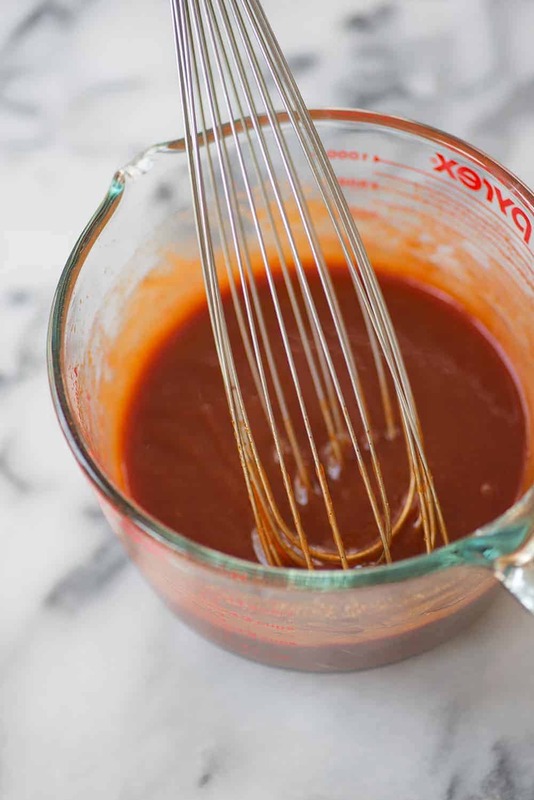 Whisk together all of the ingredients for the BBQ sauce, remove 1/4 cup then add the tempeh. Coat to cover, then place in the prepared baking pan. Bake for 50-60 minutes until tempeh is browned and caramelized. Remove tempeh from pan and toss with the reserved 1/4 cup BBQ sauce. While the tempeh is baking, make the slaw. Whisk together the mayo, olive oil, lemon juice, garlic, cumin and salt. Add the shredded vegetables, parsley and toss until well coated (I use my hands for ease.) Add the sesame seeds, poppy seeds and season to taste with salt/pepper as needed. 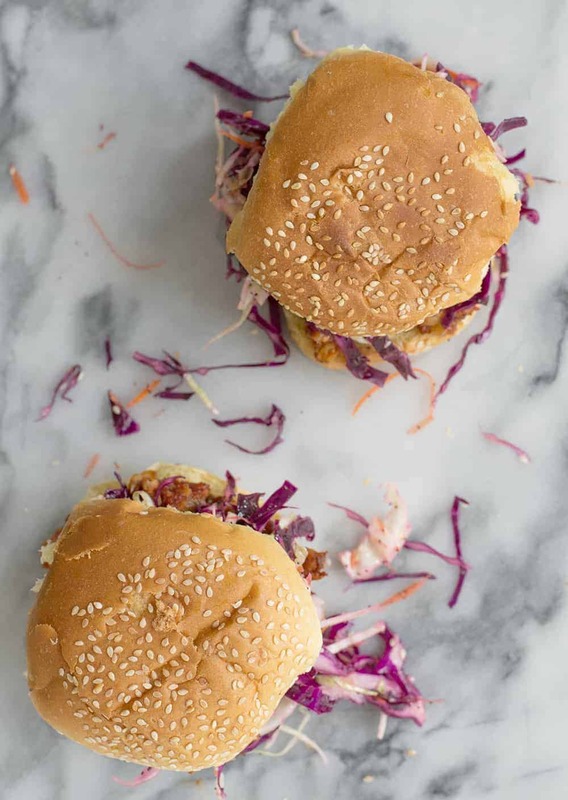 To assemble: pile the tempeh on the buns then top with coleslaw. Serve extra slaw on the side! I know there are a TON of ingredients for BBQ sauce. I can’t remember where this recipe came from as I wrote it down almost a decade ago and keep using it over and over again. It’s delicious BUT it also takes this recipe out of the ‘easy’ category. Store bought BBQ works! This coleslaw makes more than needed for the 4 sandwiches, but I love it as a side dish as well. If you don’t want extras, then just use green cabbage and skip the purple. 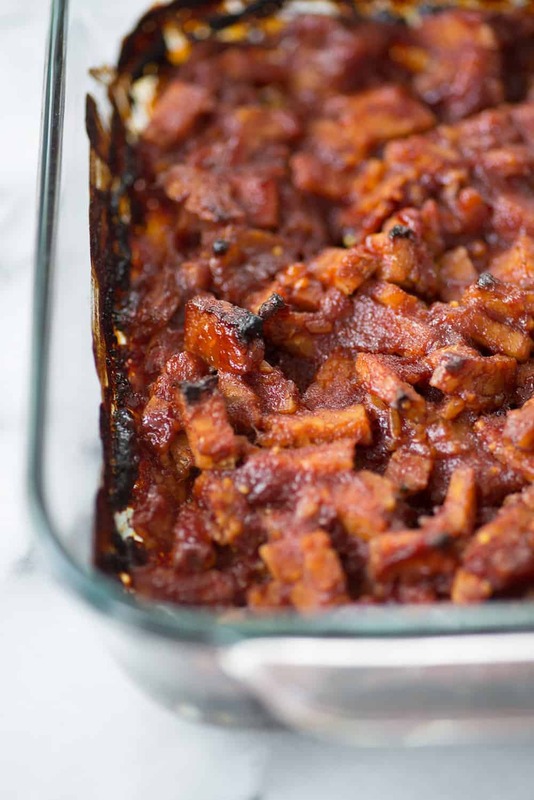 Made some tempeh “bacon” last night with a similar prep – never thought to make a BBQ sauce to go with. YUM. I’m craving these flavors lately, perhaps it’s my desire for summer to get its arse over here. Hey! So glad you signed up for the Potluck!! Tempeh bacon would work perfectly here! Such an easy sandwich to put together but tastes amazing! I’ve been craving it again all week! This looks delicious! I barely ever cook with tempeh! I think I should start after seeing this! I hope you like it! Tempeh is fun.. once you get the hang of preparing it!